The setting is the Temple. 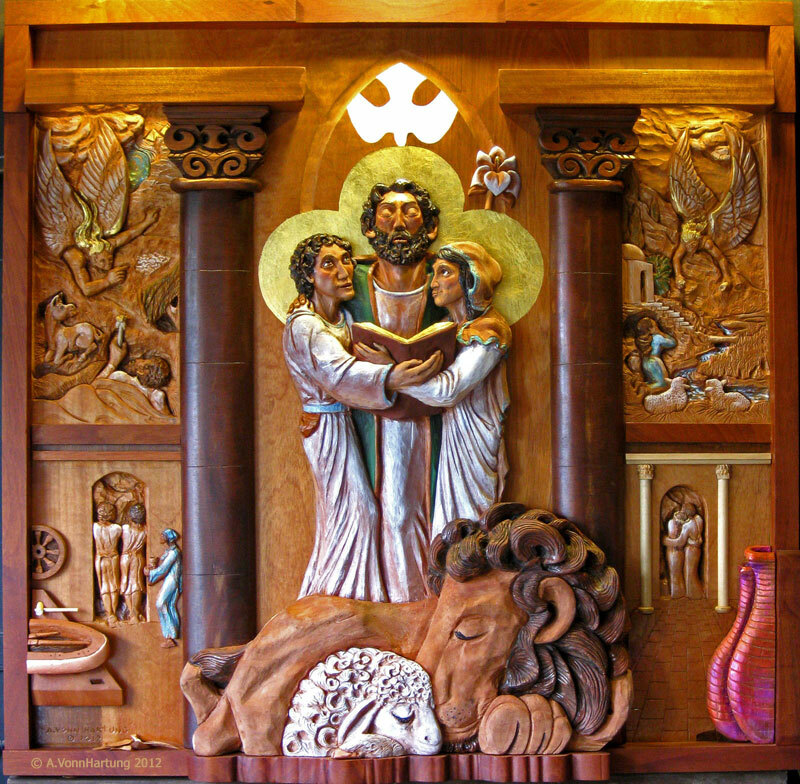 The theme is taken from Luke’s gospel (2:41-50) when Jesus is left behind and after three days of anxiety, Mary and Joseph are reunited with him there in Jerusalem. In praying together, singing thanksgiving praise and reading from the book of saints both born and yet to be born, they glorify God, signified by the inclusion of the Holy Spirit and the Father in the uncreated light of halos. In the circle of grace Mary gazes at her son in wonder and devotion, conscious of his divinity, comprehended in the visitation of Archangel Gabriel in the scene of the Annunciation depicted in the panel to her right, and evidenced by the Miracle of the Wine which came to pass at the wedding in Cana depicted in the panel below. The focus of her faith, Jesus, stands transfixed in ecstatic communion with his heavenly Father clearly visible to him. Joseph the central figure, his eyes closed deep in prayer, is the picture of humility through blind faith. Whereas Mary’s knowing comes from actual seeing, Joseph’s knowing always came through revelatory dreams. He is the picture of The Blessed to whom Jesus referred as those “who believe without seeing” (John 20:29). The panel to his left depicts a recollection of the prophetic dream he had at Bethlehem (Mt 2:13) when the angel appeared to instruct him to flee from the murderous jealousy of King Herod, to safety in the land of Egypt. Below that is a scene in the family’s carpenter show at Nazareth, Joseph with Jesus as an adult on the eve before leaving to begin his ministry (extra biblical), signified by Joseph’s single woodworker’s mallet. Further symbols here are the wheels under construction and the Bread and Chalice carried by Mary, signifying the divine message through evangelization and the supreme sacrifice of Jesus the Christ for our salvation. Published 8 May, 2014 at 800 × 784 in Wood Sculpture.